Note: This review is for international readers only. 32Red.com no longer accepts players from Australia as of 2017. When 32Red first opened their virtual doors to their Microgaming exclusive online casino in 2003, they could only dream of the reputation they’ve since developed as one of the top-rated sites available. Offering both an instant play platform, accessed via your Chrome, Safari, Firefox or other browser, and a downloadable version by installing the casino to your desktop, 32Red boasts an extensive catalogue for each with 500+ games. When you open a new account with 32Red you are instantly credited with $10 cash to play on any game you wish. There are no wagering requirements, but there is a $100 withdrawal limit on any winnings. Then you can opt in for the new player bonus where you can choose to receive $32 for every $20 deposited, capped up to $160 in matched deposits. There are 40x wagering requirements attached, with wagers on the slots contributing 100%, while table titles contribute from 0-50%. Club Rouge members see all games at 32Red contribute 100% – see below for more details. The top online casino offers a standard loyalty program with four tiers – Bronze, Silver, Gold, and Platinum – which players can climb up by accruing loyalty points (Red Rubies). Play your favourite games to earn points, and for every 1000 points earned you can exchange these for 10 casino credits. Additionally, once you reach Platinum status you may be considered for Club Rouge. Club Rouge is an exclusive membership program for high rollers. Players are invited by 32Red once they have met the requirements – usually after they hit Platinum status. You can contact the online casino if you feel you are worthy of membership however. Club Rouge members receive special promotions, customised bonus terms, and 24/7 VIP customer support. 32Red host a number of promotions throughout the year often to tie in with special occasions, or just to liven up the week. Keep an eye out here for our posts on their promotions, or simply click to 32Red and view their promotions page. While there are a few more casino games available via the downloadable casino (known as the ‘Premier Casino’) there is still everything you could want give or take a Casino War game on the 1Click 32Red instant play platform. The no download casino is divided into easy to use categories, which we detail below to show a sample of what 32Red offer. 32Red offer over 300 slots, including 5 reel, 3 reel, ways to win, and classic slots – however they are all grouped under the one category. Click ‘View All’ to scroll through all the slots available, or use the search bar to locate a specific title, such as the 32Red exclusive ‘I’m a Celebrity Get Me Out of Here’ pokie. The progressives are grouped separately from the slots, and there are 16 titles including the large network slots, such as Mega Moolah, and the smaller network slots, such as Treasure Nile. Most likely to tie in to their Club Rouge program, 32Red offer a ‘High Limit’ category, featuring four high stakes titles including a high limit roulette title and three high limit blackjack titles. Roulette gets its own category at 32Red, with eight titles including French, American, and European roulette variants, as well as Microgaming’s Premier Gold Series roulette titles. The rest of the table titles, including blackjack, poker, and other table games, such as baccarat, craps, etc., are all grouped under the one category, with their own subcategories. You can use the arrows to scroll through all the table games on offer with a total of 48 available. 32Red use to offer a variety of keno and scratch card games, but these have been removed on the instant play version, as have the live dealer casino games – but the latter could be put down to Microgaming teaming up with Evolution Gaming in 2015 to release a premier live dealer catalogue. 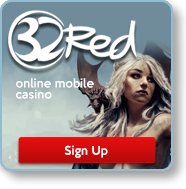 32Red also offers a mobile site where you can tap our links and access over 50 mobile optimised games, including slots, progressives and table games, via your mobile browser. The online casino also offers a native app to be downloaded from their homepage by tapping the links available here and this will sit on your smartphone or tablet’s home screen among all your other apps so you have quick and direct access. The reason 32Red has such a stellar reputation is predominantly put down to the secure gaming environment they offer on all gaming platforms. The latest data encryption technology employed ensure players’ information is protected from any kind of fraudulent behaviour, while the site is also licensed by the Government of Gibraltar (a respectable third party licensing jurisdiction). This confirms the site has a track record of excellent security protocols, as well as great payouts and fair games. To top this off, the site is also monitored by eCOGRA, an independent auditing company which regularly reviews the randomness of the site’s games and the fairness of their operations. There are a number of secure deposit and withdrawal options available at 32Red to fund your casino account with. The majority are available for both deposits and withdrawals, but MasterCard and some prepaid options aren’t. A great feature to Microgaming-exclusive online casinos is they tend to offer an extensive range of communication methods, with many available 24/7. If you have an issue simply pick a way to contact the online casino, and a helpful customer representative will be able to help you out.